A seed is pure potential. It is a shell filled with the energy and knowledge of all that came before it. It is a single point of initiation. Essentially, it is an egg. The beginning. When life emerges it must break through its hard shell to sprout. All the people, places and memories that have made the shell strong have created the opportunity for something new to emerge. The seed of me was planted in Virginia where I would be nurtured by the ocean, woods, mountains, animals and family around me. Each contributed to the structure of the shell and the content of character inside. The potential was there, given the strength, knowledge, compassion and wisdom passed on from ancestors, places and spaces. Seed Pod is the result of my family migration study. It is more of a local study as I chose to take a personal look at how my childhood made me strong through interaction with my family. The bottom of the seed is the point at which the strength to grow began. My parents, grandparents, great grandparents supported me as an infant, and each other as adults. An image of “Granny”, the great matriarch of the Lampe/Bryan family, looking at her granddaughter, my mother, filling her with the knowledge of life in China, teaching, traveling and loving. Each of the images that have been transferred onto the seed shell represent moments in the migration to who I am now. My mother grew up traveling the globe as a Navy officer’s daughter. I never knew my mother’s Mom; she died when I was an infant. I new her through Granny, who passed on the stories of what it was like growing up between the US and China with a father that was a layer for the International Settlement in China. My Dad’s father, “Grandpa Jack”, was a farmer for most of his life, as was his family. Even after leaving farm life for the railroad he raised my father on the values of hard work and perseverance, and instilled a love for working the land. When my father turned 18 the draft was in full swing. Instead of waiting to be drafted into the Vietnam War, he enlisted in the army. Grandpa retired to the beach in Virginia, which is the only home of his I knew. It was my favorite place to be. Moving from the bottom of the seed toward the top are images of my childhood with my sister and parents, my wedding, places that brought inspiration, the fruits of our garden, the hiking trails, and then my children. The layering of the images illustrates their order in history and in process of shaping the person I am sprouting into. The choice of colors is symbolic of grounding (yellow), growth (green), and spirit (blue). 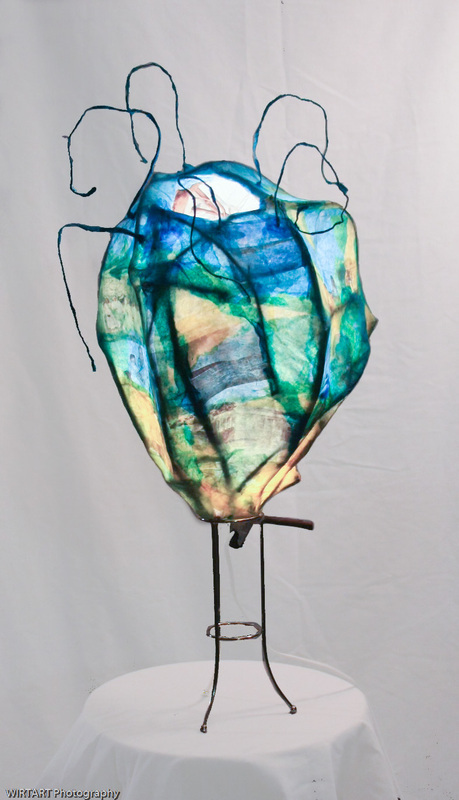 The supporting structure is a combination of vines, sticks, tissue paper and wire with a light source in the center. It is lit from within. This light from within that shines through the opening at the top of the seed is indicative of the inner light that shines out through all of us. It is a single source of light that illuminates so much. It is the moment, which ignites the potential stored within to grow.